Wayne Bissky of Laugardalsætt lives in Vancouver. 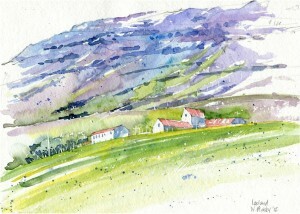 Since he had read my account of the Laugarvatnsætt´s ND and Manitoba tour, he sent me this fine watercolour sketch. Wayne is a landscape architect by profession. He wrote: „I am attaching here below a watercolour sketch I did of Mjoifjordur [Mjóifjörður], Iceland in 2012, which I thought you might enjoy. My grandmother was immensely influential in my life, and she was born in Mjoifjordur, so it has great sentimental interest. My sketch was inspired by a photo my sister Donna took while she was there on one of her trips. A number of Icelandic relatives were amateur painters and I attribute my creative interest to them. As well, there are two other landscape architects just in my immediate family, so that slice of our gene pool seems quite large.“ Inserted in Oct. 2013.